AllyCog: You're invited! Come sip and shop with Poshmark! You're invited! Come sip and shop with Poshmark! Who doesn't love an excuse to clean out your closet? And being able to make money on the stuff you're getting rid of? Even better! That's the premise behind Poshmark, an app that I've been a huge fan of since I first heard about them last year. And I couldn't be more stoked to co-host their party with some other fabulous ladies when they come to D.C. this Thursday! If you're in the DMV area, I'd love, love, love for you to stop by Lost Society on Thursday to say hi, sip some cocktails and get your shop on! 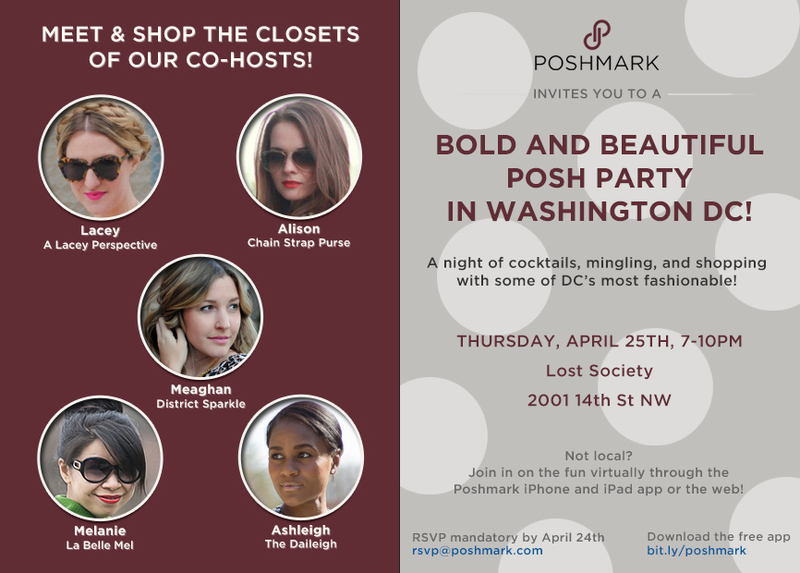 Just make sure to RSVP to rsvp@poshmark.com by April 24th (that's tomorrow!). You can also shop my closet anytime! I'm always adding new pieces so make sure to follow along :) Oh, and if you're new to Poshmark, be sure to use the code "HNTRV" for a $5 credit! Hope to see some of your lovely faces on Thursday! P.S. Don't forget to enter my giveaway for your chance to win a pair of tickets to Ball on the Mall! How fun is this?! Wish I lived closer!! So bummed I can't make this! It sounds like a blast and Lost Society is so cute! My mom is coming to town and she lands that evening. Have a great evening!